High heels, hijinks, and head honchos in Hollywood Chauvinism. Cutthroat competition. It’s all in a day’s work for Alexa Ross, vice president of comedy development at Hawkeye Broadcasting System. After years of fighting her way through the Hollywood boys’ club, Alexa thinks she’s finally free of Jerry Kellner, her sleazy ex-boss—until she leans that Jerry is her newest employee. Now it’s all-out war at HBS, and Jerry is determined to destroy Alexa. Good thing Alexa has her charming boyfriend, Gordon, and her best girlfriends for emotional support. But the pressure in her life forces her to a breaking point, and she finds herself wondering what matters most—and if she has the strength and the determination to finally shatter the glass ceiling without ruining the rest of her life. I’m not sure how long I took reading this book, but at this point it doesn’t really matter. What REALLY matters is what I learned and got out of this book. This had to be the first time I’ve ever read a women’s fiction or chic lit. To be honest, I’m more of a YA fiction type of girl, but I did give this book an exception since I won it and I’m glad I did because I learned a lot. Primetime Princess is about a woman named Alexa Ross who works at an entertainment industry called HBS (Hawkeye Broadcasting System). Alexa is what would be called a successful woman in the industry because there aren’t many vice presidents of most and any developments out there. But Alexa is and she’s sort of what the other women in the job aspire to be like. Throughout the book you learn how competitive it is out there when you’re aiming for a career as Alexa’s. Most of the jobs are taken because men are the ones who work the job and men are the ones who are mostly picked for the job. Before reading this book, I never imagined what was really going on out there and it was mostly a big slap in the face to learn the truth of the world and be put into reality (all of you should know us readers are hardly in reality). This story was also very realistic and it was easy to imagine that Alexa Ross was really a person out there in Los Angeles working behind the scenes in comedic TV shows. That’s probably what I liked most about the story—how realistic it was. I could imagine everything occurring in the story, I could see all the tension (and feel it), and I could hate the enemy of the story as much as the main character did. 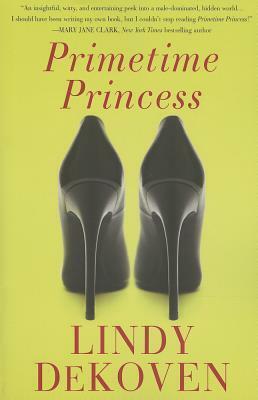 Primetime Princess by Lindy DeKoven was an enjoyable read and I hope others (mostly women) enjoy the plot of the story and what there is to learn about real life out there. Seriously girls, a career in entertainment for us is hard. Thankfully, I don’t plan on putting stress like that on my shoulders but anyone who does, read this book. You’ll learn a lot and you’ll learn one thing that’s really important: if you know you’re not gonna make it or your starting to feel doubt, just get out of there and try somewhere else. There’s always a fifty-fifty chance you could and could not make it and there’s no reason why you should sacrifice your sanity for a job. No job is worth sacrificing your personal life and losing those you love the most. Life is a whole lot better than work. My wonderful part-time reviewer, Hillary has offered to give away her print copy of Primetime Princess. To be entered to win please use the rafflecopter form below. This is great! And it looks adorable! Thanks for the giveaway! Love the cover on this one and the book sounds fun too! It is fun. And it has some comedic parts too :) Thanks for commenting and good luck!